Working with homeless persons in the various competency areas. Assisting residents in restoration of relationships and providing life skills mentoring. Assisting monolingual Spanish speaking residents in all areas mentioned. The Hubbs center is directly across the street from one of our outreach housing projects, and provide classes and mentoring in the areas of GED, English skills, Basic Computer, Advanced Computer, Carpentry Preparation, Commercial Drivers License, Medical Records Clerk, Retail Customer Service, ServSafe Food Safety, and Boilers License. The R3 Collaborative is an essential partnership for social services collaboration. We connect through R3 to many resources to assist our residents. This organization is experienced at providing training to the myriad of mentors we have available to us in the community. They provide training as not simply mentors, but social service coordinators, assisting the social worker in tracking each and every residents personal social services plan weekly. 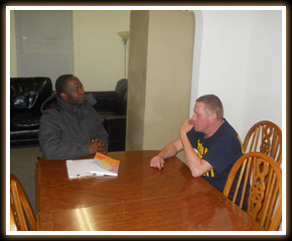 The Union Gospel Mission provides job preparation services to our residents. Our residents get plugged into the WorkNet and SuccessNet programs at UGM to assist them in successfully getting into the workforce. ASANDC partners with us to provide community service opportunities for our residents. Our residents serve seniors in the area in any way they can, including lawn care, snow removal, trash removal, painting, light repair, et cetera. Kingdom Pathways is a vendor for the Department of Employment and Economic Development (DEED) Vocational Rehabilitation Services Program. Our Social Worker and social service coordinators will provide direction for disabled residents to get admitted into the Vocational Rehabilitation Services Program. As vendor, we provide Work Adjustment Training, and Job Preparation and Placement Services for our residents. Residents receive a plethora of other services as well when they are connected into the DEED Vocational Rehab Services program, related to becoming a functional member of society. This is a crucial partnership to enable positive resident outcomes.